Fancy a look round the Lambretta Museum, in Weston-Super-Mare, but can’t be arsed to get out of your Iconic Designs Lambretta chair? Well, now, due to the miracle of Google Maps you can… by simply clicking here. And if that’s whetted your appetite, you could go and have a butchers in real life. It’s open 11am – 3pm Tuenday to Saturday, No entry fee required, but donations accepted. Back in March it was announced that the museum was going to shut at the end of 2013… and everything be sold off… but I haven’t heard anything since. But if I was you, and you fancy seeing it complete… I’d get down to Somerset sharpish. 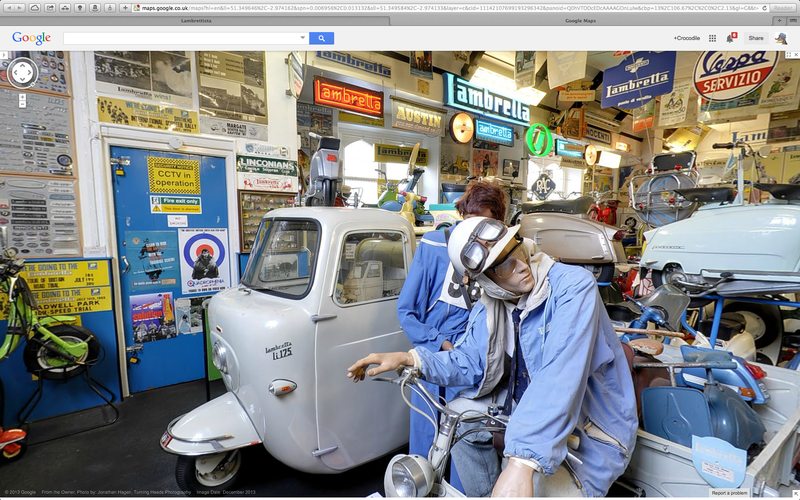 This entry was posted in Lambretta Life, Uncategorized and tagged Google Maps, Lambretta museum, Nigel Cox, Somerset, Stuart Lanning by crocodilejock. Bookmark the permalink.